Controlling unscheduled absences remains a concern for employers, whether or not they provide paid sick leave. A survey of employers by CCH Incorporated in 2007 found that 34% of unscheduled employee absences were due to employee illness, 22% to family issues, 18% to personal needs, 13% to stress and 13% to a “sense of entitlement.” Employers most frequently report using disciplinary action, annual reviews and illness verification to reduce absenteeism. Workers showing up to work sick instead of getting well at home, known as “presenteeism”, has been estimated to cost employers more than absenteeism. Not only does the ill or distracted employee operate below par, but they put their coworkers at risk as well. A 2009 survey by Kronos Incorporated found that with the economy down and jobs security low, 30% of employees reported being even more likely to show up to work sick. Those full-time workers who do receive paid sick leave accrued on average nine days after one year on the job in 2010. Most workers do not use all the sick leave they have available. According to national data, workers with paid sick leave take on average 2 to 3 days per year. A 2010 survey of workers in San Francisco, where all employers are required to provide paid sick leave, found that the median number of sick days taken during the year by all workers was 3. Average use across all industries was 3.3 days, with an average of 1.9 days in the leisure and hospitality sector – in which restaurants and bars provide the majority of employment. 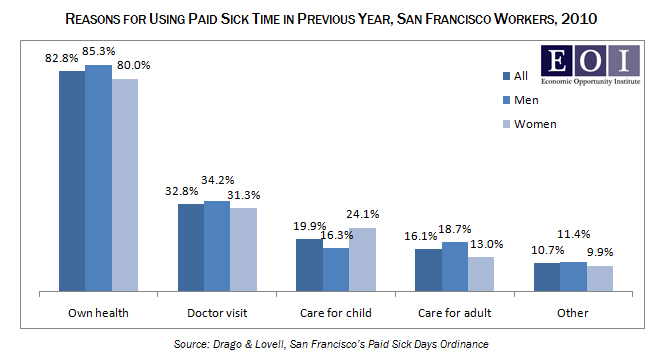 The most common reason for using paid sick leave in San Francisco was for the worker’s own health, followed by visiting the doctor, caring for a sick child and caring for an adult. One in ten workers who used a paid sick day reported doing so for some other reason, including a mental health day, a death in the family, or vacation. One-fourth reported taking no sick time in the previous year. This entry was posted in Business productivity, Healthy workers, Paid sick days, Policy and research and tagged absenteeism, Paid sick days, paid sick leave, presenteeism. Bookmark the permalink.